Premier League attendances are more than four per cent up on the same time last year, and on course to be the highest total in England’s top division for 40 years, according to Sportingintelligence analysis. The growth is all the more remarkable because there were 22 teams in the top division in the Seventies, and 462 league games per season, whereas there are only 20 teams and 380 games per season now. If this season’s buoyant gates to the end of October are maintained through to May, it is expected that 13.75m people will attend the 380 Premier League games this season, or 36,193 per game. This would beat the 13.7m from 2007-08, or 36,076 average per game, which is the current record in the Premier League era. The last time top-flight crowds totalled more than 13.7m was in 1972-73, when the figure was 13.998m at 462 games, or 30,299 on average per game. The last time average gates in the top division were as high as the current season was 1949-50, when 17.3m watched 462 matches, or 37,400 per game on average. 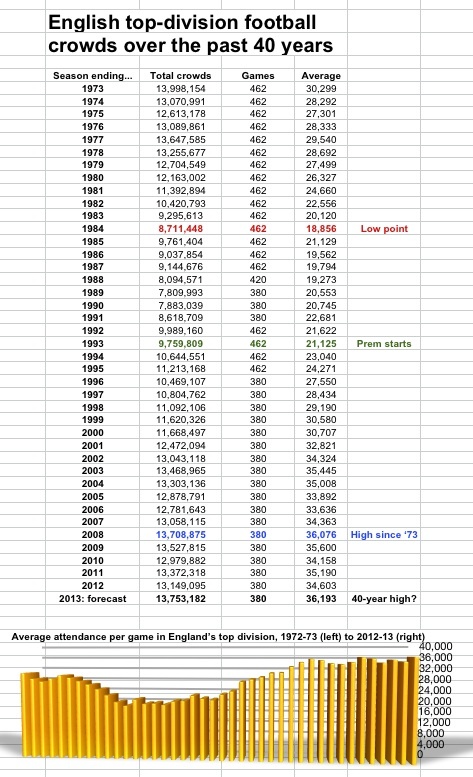 This first graphic shows how total top-flight crowds (and average crowds per game) have changed since 1972-73. Note how current attendances are almost double, per game, what they were at the low point of 1983-84, when English football was beset by hooliganism, fans were caged, racism was omnipresent and violence was a regular feature inside and outside grounds. 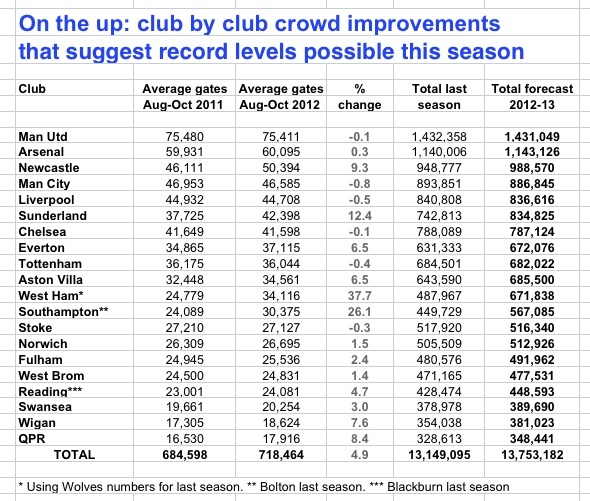 This season’s increase in crowds is only partly explained by the fact that West Ham, Southampton and Reading are attracting more people than relegated Wolves, Bolton and Blackburn were attracting last season. In fact, in an expected uplift of around 600,000 tickets sold this season against last season, only around 300,000 will be due to the change of teams. As the second graphic shows, the remaining boost is coming at established clubs, with Newcastle recording a year-on-year increase of nine per cent, and Sunderland more than 12 per cent. QPR, Wigan, Everton and Aston Villa are all enjoying crowd increases of five per cent or more. It goes without saying that individual clubs could suffer sudden drops in attendance, but this happens surprisingly rarely and total levels this season will certainly be among the highest for 40 years even if they narrowly miss the record. This appetite for the game comes despite ticket prices being much higher now than in the era before the Premier League. It is difficult to be definitive about what an ‘average’ ticket cost in 1991-92, the year before the Premier League, but if we take the crude measurement of clubs’ total match day income for that season, which was £82m across the 22 clubs, who sold 9,989,160 tickets that season, it works out at £8.21 per fan per match on average. NB: this is ‘crude’ because that figure will include money spent on ticket, refreshment, programme and anything else purchased on the day. It will also not reflect that ‘corporates’ always pay more, much more. But nonetheless, it is a guideline figure. If we jump to more recent times, the average income for Premier League clubs per ticket sold in 2003-04 was £29.69, rising to a high of £42.36 in 2008-09. This is expected to have fallen to £39.99 this season. Tell me why … we think SPOTY proves Britain to be a sophisticated sporting nation?